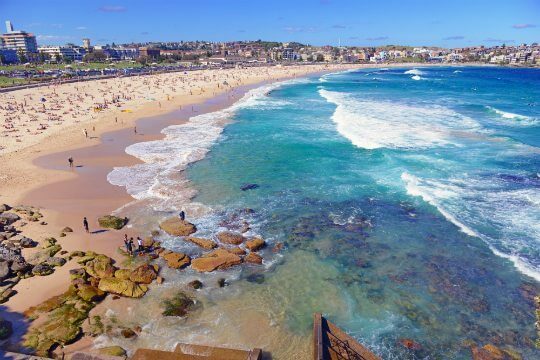 Bondi Beach is one of the most famous beaches in the world and its not hard to see why with its perpetually crystal blue water and golden sand. The name Bondi comes from the aboriginal word meaning ‘water breaking over rocks’. It’s located about 4 miles east of the Sydney CBD and is a must-see. There is a collection of Aboriginal drawings on rocks near Bondi beach. This indicates that the beach has probably been an area of interest to the indigenous people of Australia for a long time before the arrival of Europeans. Swimming was mostly forbidden at Bondi beach because of the perceived threat of what was in the water. In spite of this, buses began to run there in the 1850s and the prohibition of bathing during daylight hours wasn’t taken that seriously. It wasn’t until 1882 that the government made the beach public by law and trams started to run there. An amusement park opened there in 1887! The world’s first surf lifesaving club started at Bondi in 1907. The lifesaving club started spreading awareness of beach safety and their infamous red and yellow colour scheme has been adopted by coast guards everywhere. Another claim to fame is that the world-famous Speedos launched in Bondi in 1928! With the 50s came surf culture. Duke Kahanamoku and Isabelle Latham were the first people to surf the Bondi waters and decades later the culture had been well and truly established. Surfing is a very popular sport in Australia and Bondi beach is one of the premier places in the world to surf. The Festival of the Winds is a kite festival that started in 1978 on Bondi beach. Fast forward to today and it is one of the biggest and most well-attended kite festivals ever. The festival offers up hundreds of colourful and novel designs every year and is definitely not be missed. With all this rich history and global recognition, it is no surprise that in 2008, Bondi beach was officially named a National Treasure. How long is Bondi Beach? Bondi beach is roughly one kilometre of luscious, golden sand. What can/can’t you do on Bondi Beach? There’s a couple of things to bear in mind when visiting Bondi Beach. Barbecues are allowed, there’s even some public ones that you can use! Smoking and drinking are not permitted on Bondi Beach, or any beach in Australia, because they’re all publicly owned. This is also to reduce waste on the sand and in the sea! Who named it Bondi Beach? Bondi Beach comes from the indigenous word for ‘water breaking over rocks’ which was ‘Bondi’ or ‘Boondi’. Why is Bondi Beach so famous? Bondi Beach is famous for many reasons. First, it’s the beach of choice for thousands of people from Sydney and is so easily accessible from the city centre. The Bondi Life Saving Club is another reason it got so famous, founded in 1907. The surf culture and seminal kite festival have also put Bondi on the map! Bondi Beach is located in the east of Sydney and is a roughly twenty minute drive from Sydney Opera House. Avoid driving to Bondi beach yourself however, as the parking can be a total nightmare. There are ample bus, train and tram services and the buses run about every ten minutes from Circular Quay. From there, a bus will take you around 45 minutes. You are in Sydney however so provided you have the means and not too much to carry, walk, run, cycle or even sail there! The weather will be on your side. There’s plenty to see and do around Bondi. If you’re making a day of going to the beach, take some time to see what’s around. Not only does the beach have a number of watersport attractions, there are a few different coastal coastal walks. The famous Bondi to Coogee Walk offers up some splendid views. Behind the beach is Tamarama Park, which used to be the site of an amusement park. Bondi is largely host to inessential shopping but up at Bondi Junction there are some more high-end retail stores. There is the Bondi Golf Club, where you can see some Aboriginal drawings of marine life and play a 9-hole by the sea. Bondi Pavillion is host to plays and festivals so check out their event calendar to see what’s on. Bondi has garnered a reputation for excellent food. There’s a huge range of restaurants, cafes and bars. Bondi has the best gelato in Australia and fresh seafood to boot. If you’re looking for some culture, explore the Sculpture by the Sea exhibition. It’s free!